Green means, everything is OK, connection is secure and you are safe to enter any personal information required. If you see a yellow or red icon, connection is still run under encrypted protocol but it might be compromised. In that case, you should proceed with caution. If your connection is not encrypted, meaning there is not lock icon in place, you are strongly advised to withhold entering any information. But in the near future, all this might change. Google has announced, that Chrome browser version 56, which is to be released in January 2017, will be strongly in favor of websites using encrypted connection. When every you will try to enter information such as passwords and credit card number, browser will display a warning. On the long run, Google is aiming to completely ban all websites not using encryption. I’m running a small blog, what do I need to do? Well, at the moment, you don’t have to worry about a thing. It will probably take a long time before it comes to the point where all websites will be forced to use an encrypted connection. 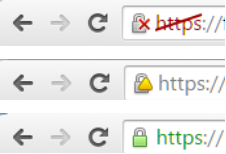 Until then, you can take some time and read about SSL certificates. Next Post Google prefers mobile users to desktop users?